I need to start by thanking Fumi Saito for providing us with the correct birth information for Sorakichi Matsuda. He was born in the prefecture of Fukui in Japan, during 1862, as Kojiro Matsuda. Before coming to America he had performed as a sumo wrestler in his native country. Very, very little is known about his early life. He was said to have also been a juggler though and a general athlete as well as competing in wrestling. He arrived in America in January 1884 on the third day on a steamship called the Guadalupe. Phil Kirby, who had been over in Japan had discovered him and felt he had to bring him over to America and act as his manager and backer against the top American wrestlers. A couple of years prior to reaching 30 years old it was said he already had fifty victories under his belt from Japan. Straight away he was pitted against a former Catch-as-Catch-Can champion in Edwin Bibby. On January 14 he was defeated by the Englishman under Catch-as-Catch-Can rules. Just under two months later on March 10, he won the return match, both had been held in New York City, but this time it was in Japanese style. That was enough for Matsuda to be paired up against any of the top men in the country. He fought men such as Captain James C. Daly, Duncan C. Ross, Andre Christol, William Muldoon, Carl Abs, Evan Lewis, Professor William Miller, and Ernest Roeber over the course of the next five years. Matsuda did not always win, but by no means did he always lose either. Unless his opponent was a champion, the matches he fought in could go either way. Not long after arriving in America Sorakichi found himself on good terms with Richard Kyle Fox, the proprietor of the National Police Gazette newspaper. Fox who was a huge name in the sporting world and held a lot of power took a liking to Sorakichi. It's said Fox ended up being somewhat of a fatherly figure to Japanese star. Some may ask why would Fox fulfill that role and the more cynical would reply, "Because Sorakichi made Fox a lot of money," which he did. Whether that was the sole reason we'll probably never know. 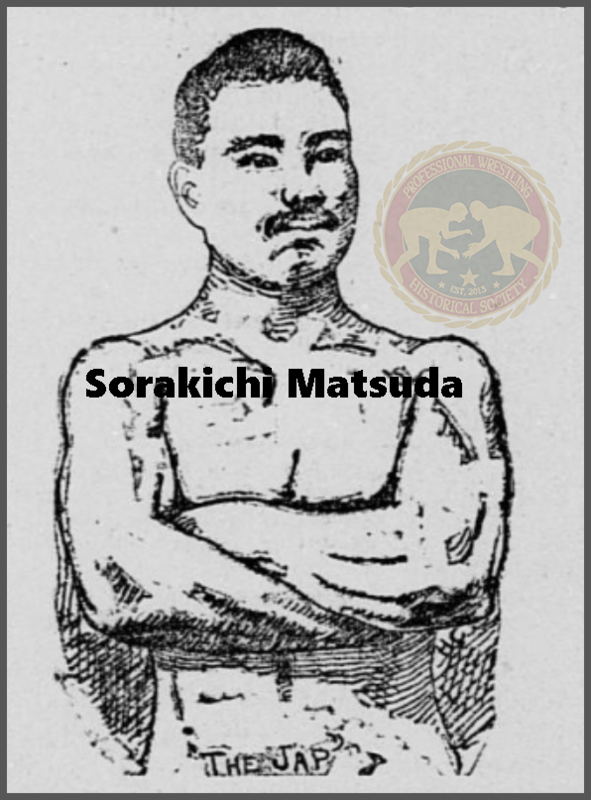 Sorakichi was the ultimate 19th century underdog with his small stature and apparent "evil," much larger opponents trying to break his limbs all the while. Matsuda's personal life was spoken of in great detail at various times in newspapers. He had married a working girl from Philadelphia, Pennsylvania and settled down. He was an instructor at the Nippon Club whilst he wrestled. His marriage deteriorated just two or three years after the couple had tied the knot. It was reported he was abusive and liked the taste of alcohol. Matsuda died while the marital dispute was still going on. Even though they had supposedly made up, she deserted him while he was on his death bed. He was still wrestling up to a month or two before his passing. Only stopping due to the illness that overcame him. He had been suffering from consumption, he had been dealing with it for a couple of years. Although he had been earning up to $5,000 a year, a lot of money then, he is said to have died penniless and his friends gave him a burial in America. He had been a very popular performer and it's a real shame he passed away so young, he had many good years left in him.